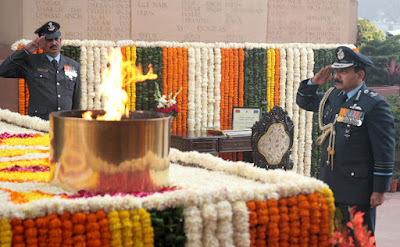 25th Chief of the Air Staff at a ceremony held at Air Headquarters (Vayu Bhawan) today. 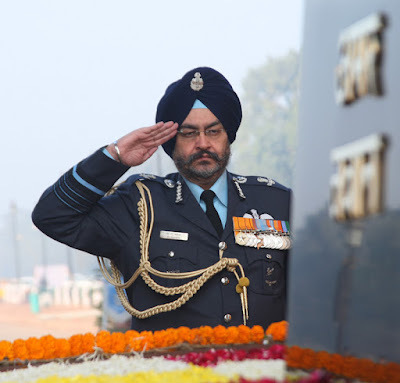 In his address to the IAF, Air Chief Marshal Dhanoa said “I feel honoured and privileged to have been entrusted with the responsibility to lead one of the finest Air Forces in the world. I will certainly be inspired by the exceptional achievements and the leadership of so many of my illustrious predecessors. In his address, he also expressed his pride at the way India's image worldwide has been showcased through the IAF's strategic reach. He commended IAF’s role as first responders in HADR situations and aid to civil authority in rendering stability to volatile situations on many occasions, besides bringing succour to people in distress. He stressed the requirement of training and equipping IAF to deter the subconvetional threats. He reiterated need for focused approach to enhance aerospace safety and IAF’s commitment for better standard of living for its airwarriors. He thanked the outgoing CAS for steering IAF on a growth trajectory and urged all airwarriors to follow the fine traditions of IAF. 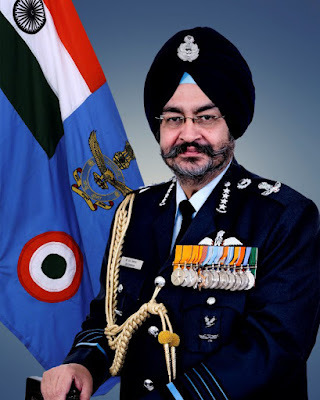 Commissioned into the Flying Branch of IAF as a fighter pilot in Jun 1978, Air Chief Marshal Birender Singh Dhanoa is a Qualified Cat ‘A' Flying Instructor and has more than 3000 hours of fighter flying under his belt with an immaculate flight safety record all along his distinguished career as a field commander. The Air Chief Marshal has held a number of significant staff appointments at operational Commands, Joint Training Establishments and Air Headquarters. He has been Director Targeting Cell and Director Fighter Operations, Assistant Chief of Air Staff (Intelligence) at Air HQ and Senior Air Staff Officer of Eastern and Western Air Commands. The Air Chief has commanded the South Western Air Command. For his experience and professional excellence, he was handpicked to establish an 'IAF Training Team' abroad. The Air Chief Marshal is also instrumental in developing the aerial targeting philosophy against the potential adversaries and transformed the concept of Air operations of the Indian Air Force to contemporary war fighting practices of Air Power. He is an avid reader and writer of issues pertaining to air power and joint operations. Before taking over as the Chief of the Air Staff, he has been the Vice Chief of the Air Staff since 01 Jun 15. In recognition of his meritorious services, he was awarded Yudh Seva Medal (YSM) and Vayusena Medal (VM) in 1999 and Ati Vishisht Seva Medal (AVSM) in 2015 by the President of India. He was also appointed as Honorary ADC on 01 Aug 15 and awarded Param Vishisht Seva Medal (PVSM) in 2016 by the President of India. He is married to Mrs Kamalpreet and they have one son Jasman who is a law graduate.